Box Text: Cook Together! Assign all of the cooks in your kitchen tasks based on their skill levels, then cook together as the experts walk you through each step! Whether you're planning a family dinner or a special event, get tried-and-true recipe recommendations from the popular cooking show, America's Test Kitchen. 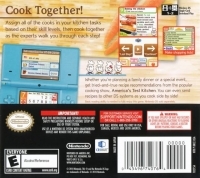 You can even send recipes to other DS systems as you cook side by side! This is a list of VGCollect users who have America's Test Kitchen: Let's Get Cooking in their Collection. 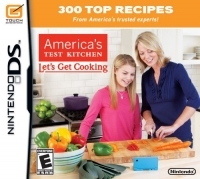 This is a list of VGCollect users who have America's Test Kitchen: Let's Get Cooking in their Sell List. This is a list of VGCollect users who have America's Test Kitchen: Let's Get Cooking in their Wish List.